Cocoanut Cake. 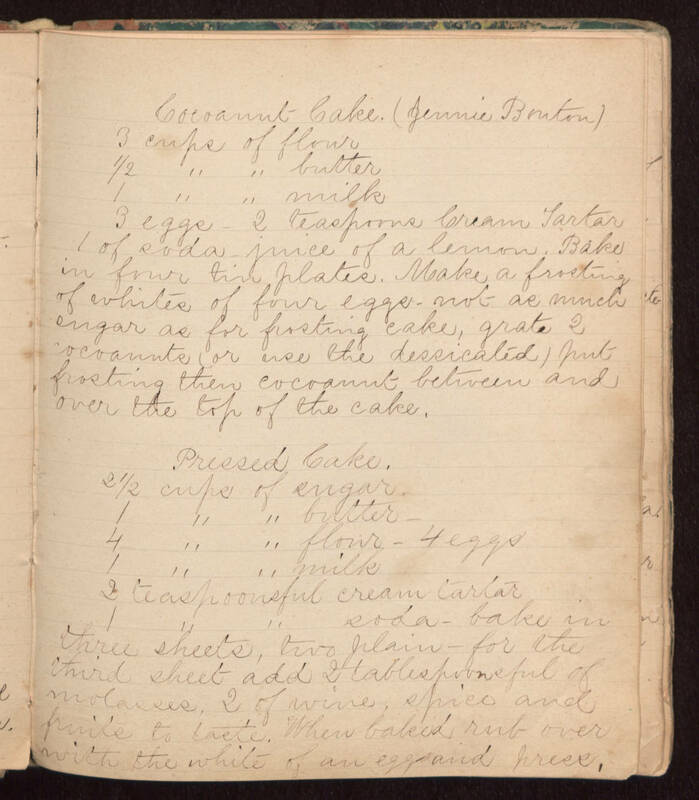 (Jennie Banton) 3 cups of flour 1/2 " " butter 1 " " milk 3 eggs - 2 teaspoons Cream Tartar 1 of soda - juice of a lemon. Bake in four tin plates. Make a frosting of whites of four eggs - not as much sugar as for frosting cake, grate 2 cocoanuts (or use the dessicated) put frosting then cocoanut between and over the top of the cake. Pressed Cake. 2 1/2 cups of sugar. 1 " " butter. 4 " " flour - 4 eggs 1 " " milk 2 teaspoonsful cream tartar 1 " " soda - bake in three sheets, two plain - for the third sheet add 2 tablespoonsful of molasses, 2 of wine, spice and fruits to taste. When baked rub over with the white of an egg and press.